Hello everyone! Is anyone else excited for the weekend? I know that I am, and I have it packed full of activities! I hope the weather cooperates, because it's looking beautiful so far. 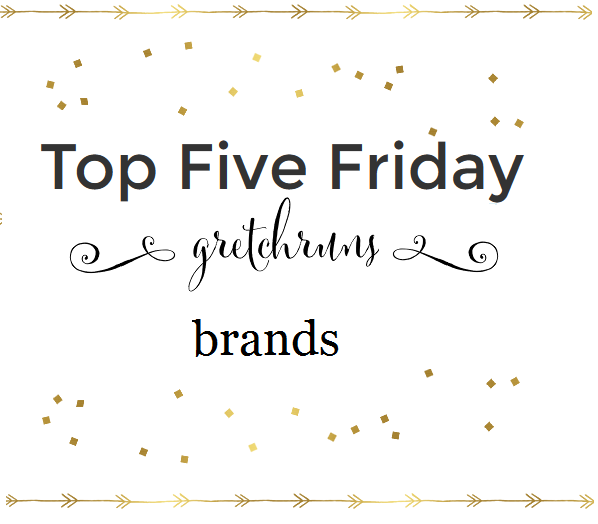 Today, for the weekly Friday Five linkup (with Mar, Cynthia and Courtney), we're talking about Top Brands! This is a really fun topic, and I can't wait to see what everyone else comes up with. I decided to pick my top brand for five different areas, as well as some suggestions on my favorites from each brand. Let's get into it! Check out my review of recent purchases here! Nastia Liukin blew me away again this week. I loved the Disney theme, and I think she embodied it the most. If Disney decided to make a live-action Frozen (PLEASE) they should cast Nastia and Derek as the leads! I also loved Riker's Pirates of the Caribbean-themed dance. He was perfectly in character, and he danced the Paso Doble almost as if he was drunk, just like Jack Sparrow would! I almost don't want to mention the Voice, because I'm SO disappointed that my Pittsburgh girl, Mia Z was eliminated. What! She has such an incredible voice! I hope she'll do some shows in the city soon because I would love to see her perform. I also loved all of Team X-Tina and will solely cheer for them the remainder of the competition. Seriously, how many times can Rayvon get voted in the bottom two and survive? Insane! I really loved Jax's performances last night as usual (so fun and energetic) and Quentin also impressed me (not "whack" at all...that was an intense moment!). Dan and I both agree that Clark is probably the best vocalist and I think he could possibly win. Two amazing performances by him as well! I'm so late to the band wagon on this show, but I'm completely obsessed. I'm almost halfway through season 4, and I don't know what I'll do when I finish! (Luckily OITNB is coming back soon...). Does anyone else have a HUGE crush on Taylor Kitsch AKA Tim Riggins? I usually don't like long hair, but it works on him! This song is in the new release of both my Centergy and Power classes, which is fine with me because I love it! It's a really fun, mellow song. I love Taylor's voice! I've heard this song a few times, but never knew it was Sia. It's a really haunting-sounding song and is really interesting. I like both the original version and the piano/vocal version. I love this version of a very popular song-picking up the tempo and playing in a bluesy style. I can't tell you how many times people have asked me to play the sax part of this song, but I love it anyway! This version has one of my favorite musicians - Dave Koz. He's so incredible. I love how he breaks into "Take Five" during his solo. So original and cool! I love JHud, and this song really show cases her amazing voice. Make sure you listen to the second half- it's amazing! Perfect running song! It has a really good driving beat, and also has a fantastic message. This will definitely be on my half marathon play list. Also linking up with Clare, Heather and Katie. I completely agree! I'm obsessed..especially with their winter scents. Hahhaha same here!!! I'm in love with that show and the people! oh yes oh yes to a lot of things on your list! tim riggins = swoon. i've actually told my husband that he should watch fnl bc i want our marriage to be like coach and tami's. love that show! have a great weekend! They have the best marriage ever!! They are so sweet to eachother. Love them! I love Trader Joe's food but hate going there because it's so small and crowded. I want to try the new one that just opened in the North Hills, but I heard that's just as crowded because it's so new. I look forward to your review of Madewell! I actually rarely buy real clothes--I mostly buy fitness clothes, sad but true--so never know where to shop when I need real clothes. Ugh I know what you mean. Dan hates going there and he literally stands in one spot the entire time with the basket and I run all around getting stuff and putting it in. It's a madhouse! We started going when they open on the weekend and it's much calmer. I love Bath & Body Works and Sephora! I get so much great stuff from them. I always have stock in Bath & Body Works foaming hand soaps for each season. I love that entire Sia album it's definitely my fave, I saw her live when she did the tour for that album and it was incredible. LOVE her! That's so cool!! I'm loving listening to her older stuff. She has such a great voice and her songs are all so amazing. I heard she's releasing a new album this year of songs that she's written for other artists, but didn't end up selling them because she was so in love with them. I can't wait! It took me a while to get into Survivor this season. They all seemed so whiny at first. I don't like Rodney but I LOVED his impression of Mike. Hilarious and spot on! Have a great weekend. This is great! LOVE trader joes. Also, I want to set up a tent and live in sephora. Love this list! Happy Friday! Hahah if you get a tent invite me!! I love it there..and they're always so friendly and helpful! What a fun list! I love your choices. You also reminded me I have to hit Sephora for some makeup ASAP! I made a trip there this weekend! Love it! I like how you listed things by category :) I am a huge fan of Survivor and am glad to see new competitors instead of repeats and celebrities! I agree! It makes it so much more fun to watch.and cheer for them. I love sephora! Sadly I have to limit my visits because I can't get out of there without spending way too much money! Ugh me too. I try to only go during their sales which are luckily only twice a year. It's a treat for sure!